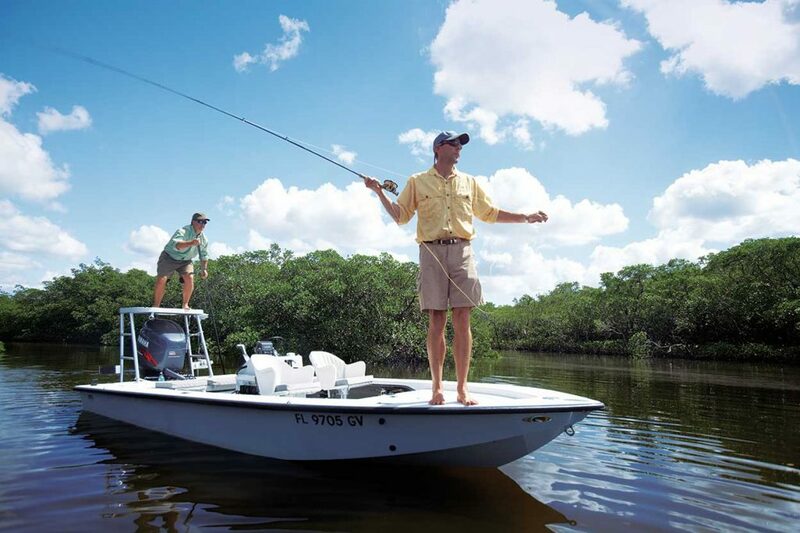 In Chokoloskee, Florida, fishing reigns supreme against a backdrop of local flavor. On the southwestern coast of Florida, a small community amidst the mangroves preserves the final remnants of the Old Florida lifestyle. In Chokoloskee, and its neighbor, Everglades City, seven miles to the north, there’s no pretense. There is, however, a legacy left by early pioneers, whose descendants now populate the area. There are also ghosts—if you know where to look. The locals have been here for generations. They’ll eye you steadily from their seats as you launch your boat at the marina, and maybe even ask where you’re from. “We’re Florida folk, here to do some fishing,” is a fine response. But don’t ask about the town’s drug smuggling bust in 1983. Mention that, and the locals might reply that people can easily get lost out in the mangroves. And out in the mangroves is really what it’s all about. Chokoloskee borders the western edge of Everglades National Park, and with it the Ten Thousand Islands. The name is well deserved. With over 2,000 square miles of identical-looking mangrove islands and channels, oyster bars, bays, and shallow waters, it’s easy to get lost. When you’re out on the boat each turn in the channel looks the same. The blue-green water reflects both the mangrove islands and the sky, creating natural fractals as far as the eye can see. Even when you think you might be in the clear, shallow flats and treacherous ridges silently wait. You need a guide. A local, someone who knows the twists and bends in the channels. Someone who knows when markers have been flipped. Someone like Brian Sanders, who runs fishing charters in Chokoloskee over 250 days a year. He knows where the fish will be biting, when the tide will turn and, most important, the way back inland. For decades, the wilder side of Collier County has drawn sportsmen and outlaws alike. The area’s isolation was, perhaps, the biggest draw for the latter, but it has also fostered the perfect atmosphere for a fishing experience unlike any other on this remote edge of the Everglades. There aren’t many places on earth that can rival the beauty and complexity of the Ten Thousand Islands. A diversity of animal and marine life comes from a shared ecosystem as freshwater and saltwater combine. A quick offshore run reveals everything from dozens of bird species and smaller fish to large alligators soaking in the sun and dolphins breaking through the waves. The beaches sometimes offer glimpses of deer, wild pigs, and even bears. To the northwest of Chokoloskee lie thousands of mangrove islands that dot the murky waters and echo postcard-perfect scenes. They also confuse and confound the uninitiated. To the south, tidal rivers flow through the backcountry. You can fish scoured holes, river mouths and oyster bars here. The rivers and flats form habitats that support and nurture the species anglers are after. Both artificial fishermen and live baiters will have luck fishing the rivers. Sight fishing is also an option in the clear headwaters of the river, even with the slight tint due to the tannic acid of the mangroves. The rivers to the north of Chokoloskee include Pumpkin, Ferguson, Wood, Little Wood, and others. Here, you’ll find that the small mangrove islands and feeder creeks form a safe refuge for fish, including the area’s local population of smaller tarpon. Each northern river dumps into large bays, while the surrounding mangrove islands form channels of flowing tidal waters. With depths of scour holes reaching some 20 feet deep, the largest of the snook, tarpon and goliath groupers move into areas in the warmer months. The cooler months bring large black drum, Spanish mackerel and cobia. The southern rivers—Chatham, Lopez, Lostman’s, Broad—are big enough to hold redfish, tarpon, and snook. There are more fishing spots than you could explore in a day, or perhaps even a lifetime. And oftentimes, a trip through the backcountry will see a catch of over a dozen different species of fish. Head a bit offshore to find the numerous natural and artificial formations that attract fish like cobia, kingfish, snapper, and even permit. While there’s plenty of space for fishing in the Ten Thousand Islands, there’s a lot of history and character packed into the 137 acres of Chokoloskee. The story begins with Ted Smallwood’s General Store at the turn of the 20th century. Ted Smallwood built his store on the edge of Chokoloskee Bay in 1906, and it soon became the central meeting place for all of the town’s happenings—drawing gossip, gambling and trade. It also drew some of the more unsavory figures in the area. There are skeletons in the closets of the town, even if they don’t make much noise. One such skeleton is that of Edgar J. Watson, who was rumored to have been an outlaw that once ran with Jesse James. Watson settled on a plantation at Chatham Bend and was a frequent visitor at Smallwood’s store. Once his hired workers began disappearing one by one, however, the town grew suspicious. The townsfolk later confronted Watson at Smallwood’s in an event that led to Watson’s demise. Local rumor says the ghost of Watson lives around the store to this day. Smallwood’s is no longer a general store. Instead, it’s now one of the most unique museums in Florida. Open the wooden doors, walk inside and be transported back to the 1920s. Within the walls, you’ll find rocking chairs, wagon wheels, old glassware, and even quirkier artifacts. Ever since Ted’s family reopened the store as a museum, it’s stood as a time-weathered monument to the unique history of the Ten Thousand Islands. There’s history here in Chokoloskee and a colorful past with tales of mystery and intrigue. There’s fishing and a peaceful solitude that’s hard to find elsewhere. But there’s also the present moment while you’re out in the bay. One of my favorite parts of Chokoloskee is its ability to make an impression. It changes you in small ways for the better. It fosters a sense of community and togetherness that’s hard to find in other parts of the country. Events like the annual Seafood Festival in Everglades City, for example, delight locals and guests alike with its bounty of fresh seafood and craft booths. Finally, it creates memories that will keep you coming back, time and time again. Yet, while Chokoloskee has the ability to create memorable experiences, it also teaches some tough life lessons. Rabbit Key, the site where the notorious Edgar J. Watson is buried, is also the place where I lost my first redfish when I was five years old. Back then, I didn’t really understand fish mortality, and I pressured my father to dip the redfish back in the channel so it could breathe. A quick flip of the tail and it got away. I remember feeling slightly relieved. My father was arguably less so. But this means that now, years later, I have one more excuse to head through the channels past the sweeping mangrove islands out toward Rabbit for some redfish redemption—with a guide, of course. It is always, already, a place I like to be.